Goodbye DreamHost, our relationship was short lived. Change is good! I’m not just talking about the kind that jingles in your pocket like sleigh bells, but that’s nice too. I’m talking about HOSTING! You may have noticed over the past year or two that we’ve totally amped up our VPS game. We’ve increased memory. We’ve installed super-fast slick new SSDs for lightning-fast data access. AND we’ve lowered prices. Now we’re about to roll out another change to our VPS services that may affect you! We will be removing admin (sudo) access from all DreamHost VPS instances. All of our Virtual Private Servers are managed. That is to say that we provide you with a specific software environment and we work hard to keep it up to date with security patches and all the latest updates. When users take server management into their own hands with the “sudo” command, this can limit our own ability to provide a safe and reliable managed hosting environment. The good news, for users looking to have more control over their hosting environment, is that our cloud computing service, DreamCompute, is completely unmanaged. Install whatever software you like! Don’t need a web server? No problem! We’ll provide you with a base OS install (or you can even upload your own!) and that’s it. Use sudo, or heck, just login as root if you want! DreamCompute provides the full and complete remote server control that so many of our VPS users have been craving for years. Sudo access will be disabled on Monday, November 30, 2015. Please be sure to check out DreamCompute if you’re looking for virtual computing resources but want full control of everything! We think you’ll find it’s a great complement to traditional, managed VPS services. As always, our brilliant tech support team is on standby if you’ve got any questions about this change. You can contact them from the Support section of your account control panel at any time. Well after spending hours compiling and configuring a custom Apache 2.2/PHP7-FPM configuration on DreamHost not even a month ago, they decided that on November 30th they were going to disable sudo/admin access to their VPS offerings. 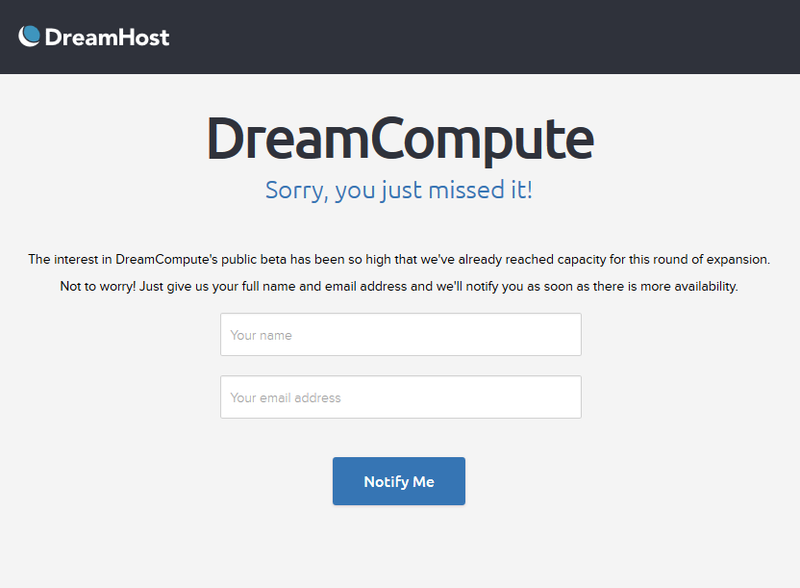 That wouldn’t be such a bad problem had they actually offered an alternative, but instead they keep referring everyone to their DreamCompute platform which is currently at capacity and not taking any new signups. I’m not sure what their game plan was here, but it was clearly not well thought out. I’m going to be setting up a DigitalOcean droplet here soon, which should offer everything I need, and isn’t “managed” by a bunch of boneheads. I’m not sure why they advertise these as Virtual Private Servers, they clearly don’t want you having any ownership over them. I’m sorry you missed me too, I guess I won’t be using you.